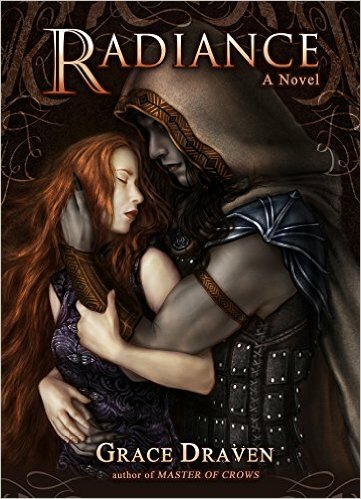 Radiance is the first book in The Wraith Kings series by Grace Draven. With the cultural divide that currently besets America, I loved how the author addressed how two dramatically different cultures can peacefully co-exist. A very timely story with far-reaching implications. SUMMARY: ~THE PRINCE OF NO VALUE~ Brishen Khaskem, prince of the Kai, has lived content as the nonessential spare heir to a throne secured many times over. A trade and political alliance between the human kingdom of Gaur and the Kai kingdom of Bast-Haradis requires that he marry a Gauri woman to seal the treaty. Always a dutiful son, Brishen agrees to the marriage and discovers his bride is as ugly as he expected and more beautiful than he could have imagined. ~THE NOBLEWOMAN OF NO IMPORTANCE~ Ildiko, niece of the Gauri king, has always known her only worth to the royal family lay in a strategic marriage. Resigned to her fate, she is horrified to learn that her intended groom isn’t just a foreign aristocrat but the younger prince of a people neither familiar nor human. Bound to her new husband, Ildiko will leave behind all she’s known to embrace a man shrouded in darkness but with a soul forged by light. WHAT I THOUGHT: I knew I was on to a good book when I saw 1,212 reviews with a 4.7/5.0 rating on Amazon! Congrats to Grace Draven. Based upon what I read, the rating is well deserved. The Kai are a race of nocturnal beings with deathly pale skin and long fangs. Certainly the sight of one would be enough to make any sane human run. And many do. But for Brishen (Kai) and Ildiko (Human), they are married to secure an alliance for a treaty between their nations and have no choice but to tolerate each other. But much more happens to them. The couple are initially repulsed by each other’s physical appearance, but both choose to look beyond the physical and discover the unique and lovable individual within each. Their relationship grows from tolerance, to understanding, to a deep and abiding love for each other despite everyone around pitying them for the choice forced upon them. It is a very timely theme in light of the racial tensions currently besetting this country. We could all take a lesson from this for I think this thinking works in practice as well as in fantasy. While I thought the author did an amazing job with world-building as well as character development, I have two complaints. The first is the plot seemed prescriptive and contrived, lacking subtly and intrigue. I love novels that keep you guessing and when the reveal finally happens, you’re surprised because you saw all the clues but never pieced them together. This ain’t that. The author laid out the clues, but in a way that they seemed obvious that she was setting up something for later on. Not a huge negative, I just thought this could have been epic if there was as much finesse put into plotting as character development. The other small complaint I have is with the ending. The author leaves us with a wrapped up story, except gives us an epilogue that seems very different than anything that happened in the story. It’s not that I couldn’t connect the dots and say “okay, that’s possible” but the author used an unrefined way to set up the next book. I just thought it could have been done with a bit more finesse. Again, this is not a huge issue, but it just struck me as not fitting in with everything the author had so beautifully set up in the first book. Warning: This is not YA. There are a few sexually explicit scenes as would be expected in this Adult fantasy romance work.